In October 2014, the Waring Library prepared its collection for relocation in anticipation of a major HVAC-system replacement project. The entire first floor collection was packaged and sent to other safe spaces for the duration of the project. During this initial packing phase and during subsequent months, the Waring Library’s portrait collection was evaluated to document existing canvas and frame damage. Professional art handlers and conservators were brought in to perform this work. Based on their review and recommendations, the Waring Library Society board is pleased to announce a multi-year campaign to raise the money to provide conservation treatment to these 19 items. ALL portraits in the collection were found to be in need, some requiring more serious intervention than others. As a group, they portray the accomplished doctors, scientists, and medical leaders who were leaders of the Medical Society of South Carolina, the Medical College of South Carolina (now MUSC), and South Carolina medical community. The goal for the project is $150,000 which will pay for all the work to conserve these visual treasures. The cost for each portrait’s conservation ranges from $1,200 to $15,000. This cost includes the conservation/ treatment report, conservation of the canvas and frame, and any costs associated with the treatment such as curatorial research and documentation, photography, transportation, and insurance. As a thank you gift, donors will be offered a reproduction of their “adopted” portrait, printed on canvas and suitable for framing. In order to kick-start the project, the WLS sent the portrait of Alexander Baron off for conservation. 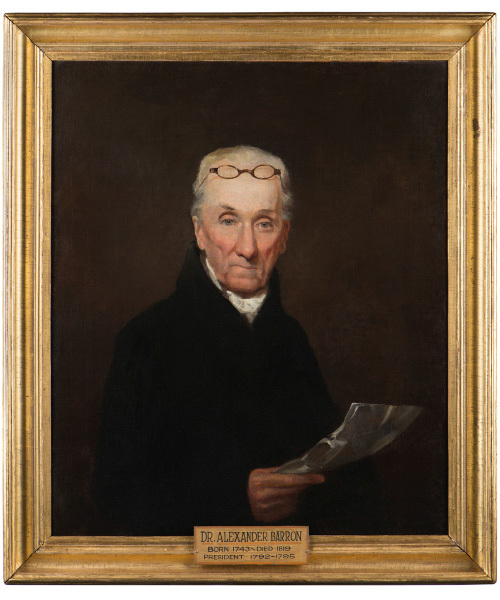 Dr. Baron was selected for two reasons: first, the sitter, Dr. Baron, was a founding member of the Medical Society of South Carolina, whose generous support of the Waring has enabled us to conserve and digitize numerous items from the collection. Second, the artist of the portrait was Samuel B. Morse, whose portraiture career in Charleston included painting the city’s leaders.